Bacteria are the #1 cause of tooth decay. The chemicals they produce will gradually erode your tooth, eventually killing it. This decay then can spread to neighboring teeth causing the same damage to them. Leaving tooth decay alone can cost you much more than money if left alone. It is very important to treat decaying teeth and restore them to a healthier state. Decay needs to be removed, the decayed area cleaned and the tooth restored with a filling. Missing or badly damaged teeth need to be replaced. Composite Fillings are the most common dental restoration. No one wants a cavity, but most of us will have one at some point. Cavities are one form of tooth decay and, if left alone, can cause serious problems. Fillings are used to fill in a cavity after it has been treated. They may be filled with silver amalgam, gold, tooth-colored glass or plastic materials. We want to stop the tooth decay from spreading. Fillings are appropriate for all patients, ranging from child to adults. Bacteria causes tooth decay. The chemicals produced by bacteria gradually erode your tooth, eventually killing it. Additionally, decay can spread to neighboring teeth, damaging them in the process. Ignoring tooth decay can cost you. You want to treat decaying teeth and restore them to health. Dr. Palani will remove the decay, clean the decayed area and the tooth will be restored with a filling. Missing or badly damaged teeth will need additional work. Crowns are tooth-shaped caps which are placed over the tooth. This restores the tooth's size, shape, appearance, and gives the original tooth strength. Our natural teeth begin to weaken with time, they become more susceptible to problems including decay, cracks and discoloration. Crowns can help you recover your smile. Crowns can be made from many materials including porcelain, porcelain fused to metal, or a gold crown. Dr. Palani at Total Smile Care, can help you choose what is best for you. Crowns are also used to cover an implant or to hold a dental bridge into place. Root canals or Endodontic Treatment, are needed when decay has caused permanent tooth damage to the pulp. Root canals are completed by removing the pulp inside of the tooth and replacing it with a filling material. This treatment is an effective way to prevent infection. Infection is usually related to the nerves in the root of the tooth. Infected nerves need to be removed. Left untreated, infection can turn into an abscess, which is a much more serious problem that includes bone loss in the jaw. Tooth Extractions may be needed in the event that a tooth is too severely damaged to be repaired. It is the removal of the tooth. There are a variety of reasons for extraction including, untreated decay, trauma, infection, or a crowded mouth. Dental bridges replace missing teeth. 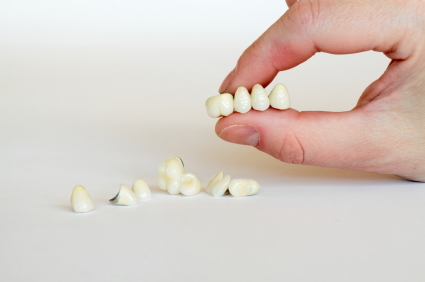 Dr. Palani uses your existing teeth to literally create a bridge for your missing tooth. Bridges are made from a variety of materials including gold, metal, alloys, or porcelain. They are strong and durable. Ask us at Total Smile Care what products we have available and together, with your dentist, we can choose the option that is best for you. Dental implant surgery replaces missing tooth roots. We create a stable foundation for replacement teeth, crowns, that look, feel and function like your natural teeth. Dental implants are important as they also preserve the remaining bone by providing the stimulation previously provided by the natural tooth roots. Dental implants are now the preferred method of tooth replacement. With extensive training and the latest technology, Dr. Palani's office is a one-stop location for your dental implant. Sound scary? Relax, we're experts. We have all been told how scary a visit to the dentist can be, which is why we have become experts in relaxation dentistry. We want you happy, relaxed and ready for a better smile. You will have a variety of sedation options available to you in our office to ensure your visit is a pleasant one.